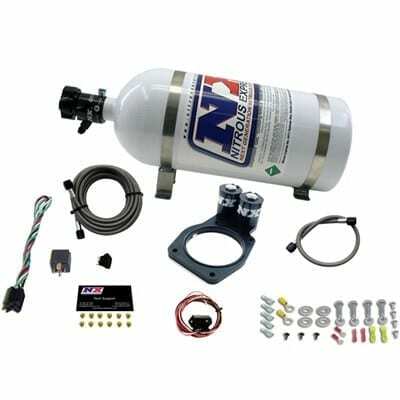 The Nitrous Express 5th Gen Camaro Plate System features Phase 3 Spraybarless technology for the ultimate in atomization and distribution. The billet plate bolts between the throttle body and intake making installation quick and easy. The LS3 plate system is the thinnest plate on the market which allows you to install a plate system on your vehicle without relocating anything or having to flip the throttle body over, it is a truly bolt on nitrous system!! The solenoids are integrated into the plate for a super clean look and no need for additional lines or mounting brackets!! This system includes a TPS Autolearn switch so the nitrous only activates at wide open throttle and automatically turns off when you let your foot off the accelerator. Fits 2010 – 2016 V8 Camaros, and 2008-14 Corvettes with the LS3 engine. Billet Nitrous plate with integrated Lightning Series Nitrous and Fuel Solenoids. TPS Autolearn Wide Open Throttle switch. Every nut, bolt and electrical connector needed to complete the installation.